For the county library system, see County of Los Angeles Public Library. The Los Angeles Public Library system (LAPL) serves the residents of the City of Los Angeles. The system holds more than six million volumes, and with over 18 million residents in the Los Angeles Metropolitan area, it serves the largest population of any publicly funded library system in the United States. The system is overseen by a Board of Library Commissioners with five members appointed by the mayor of Los Angeles in staggered terms in accordance with the city charter. Library cards are free to California residents. Circulating books, zines, periodicals, computer access and audiovisual materials are available to patrons. Books, magazines, and audiobooks are loaned for 3 weeks. Music cassettes, music CDs, documentary videos, and documentary DVDs are loaned for 1 week. Entertainment videos and entertainment DVDs are loaned for 4 days. Fines are charged only if materials are returned late. There is a loan limit of 10 books, 10 magazines, and 4 DVDs or videos at one time up to maximum of 30 items on the patron's record. Items checked out from Los Angeles Public Library may be returned to any of its 72 branches or to the Central Library. Most items may be renewed a maximum of two times. Entertainment DVDs and videos may be renewed one time. The Los Angeles Public Library has many community support organizations which work with the library to raise funds and sponsor programs to enhance library service throughout the community. The Library's Rare Books Department is located in its downtown Los Angeles location. There is also an extensive selection of databases covering a wide variety of topics, many of which are available to remote users who hold an LAPL library card. Examples include full-text databases of periodicals, business directories, and language learning tools. 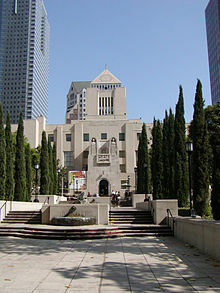 The Central Library at 630 West 5th Street, between Grand Avenue and Flower Street in Downtown Los Angeles, remains an important research library, despite the development of accessible databases and public access to the Internet. The library also offers an online program that allows adult patrons who have not completed high school to earn their high school diploma. The Los Angeles Library Association was formed in late 1872, and by early 1873, a well-stocked reading room had opened under the first librarian, John Littlefield. Aggressive expansion and growth of the system began in the 1920s. Under Library Board of Commissioners Chairman Orra E. Monnette, the system was improved with a large network of branch libraries with new buildings. Thelma Jackman founded the Business & Economics section of the library sometime prior to 1970. The historic Central Library Goodhue building was constructed in 1926 and is a Downtown Los Angeles landmark. The Central Library was designed by the architect, Bertram Goodhue. The Richard Riordan Central Library complex is the third largest public library in the United States in terms of book and periodical holdings. Originally named the Central Library, the building was first renamed in honor of the longtime president of the Board of Library Commissioners and President of the University of Southern California, Rufus B. von KleinSmid. The new wing of Central Library, completed in 1993, was named in honor of former mayor Tom Bradley. 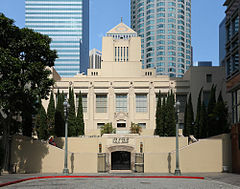 The complex (i.e., the original Goodhue building and the Bradley wing) was subsequently renamed in 2001 for former Los Angeles Mayor Richard Riordan, as the Richard Riordan Central Library. The Los Angeles Public Library received the National Medal for Museum and Library Service, the nation's highest honor given to museums and libraries for service to the community. City Librarian John F. Szabo and community member Sergio Sanchez accepted the award on behalf of the library from First Lady Michelle Obama during a White House Ceremony on May 20, 2015. The Los Angeles Public Library was selected for its success in meeting the needs of Angelenos and providing a level of social, educational, and cultural services unmatched by any other public institution in the city. The award recognizes the library's programs that help people on their path to citizenship, earn their high school diploma, manage personal finances and access health and well-being services and resources. A portion of the four-part mural by illustrator Dean Cornwell depicted the stages of the history of California at the Los Angeles Central Library. Architect Bertram Grosvenor Goodhue designed the original Los Angeles Central Library with influences of ancient Egyptian and Mediterranean Revival architecture. The central tower is topped with a tiled mosaic pyramid with suns on the sides with a hand holding a torch representing the "Light of Learning" at the apex. Other elements include sphinxes, snakes, and celestial mosaics. It has sculptural elements by the preeminent American architectural sculptor Lee Lawrie, similar to the Nebraska State Capitol in Lincoln, Nebraska, also designed by Goodhue. 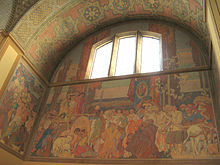 The interior of the library is decorated with various figures, statues, chandeliers, and grilles, notably a four-part mural by illustrator Dean Cornwell depicting stages of the History of California which was completed around 1933. The building is a designated Los Angeles Historic-Cultural Monument, and is on the National Register of Historic Places. The Central Library was extensively renovated and expanded in a Modernist/Beaux-Arts architecture, according to Norman Pfeiffer, the principal architect of the renovation by Hardy Holzman Pfeiffer Associates from 1988 through 1993. It included an enormous, eight-story atrium wing dedicated to former mayor Tom Bradley. Now, the library contains an area of 538,000 square feet (50,000 m2), and has nearly 89 miles of shelves and seating for over 1,400 people. The building's limited access had caused a number of problems. Generally, the accessible public stacks in the reading rooms only displayed about 10 to 20 percent of the actual collections of the Central Library. For anything else, a patron had to submit a request slip and a clerk would retrieve the desired material from the internal stacks. Internal stacks were packed very tightly and had very little headroom. For example, while the normal reading rooms had ceilings of anywhere from ten to fifteen feet, the internal stack areas were many shelves of about six-foot height, stacked internally, so that while the public access area was about two floors plus the Science and Technology alcove, the internal stacks were approximately five or six floors. To fix this would have required substantial renovation, a cost the city was not willing to cover, especially after hours of operation were cut in response to the 1978 property tax reduction measure Proposition 13. The catalyst for the renovation was a devastating arson fire on April 29, 1986. Although the building was safely evacuated, its vintage construction precluded the ventilation of heat and smoke, and limited firefighter access. It took firefighters over seven hours to extinguish the fire and little fires continued to sprout for several days. Some 400,000 volumes—20 percent of the library's holdings—were destroyed, with significant water and smoke damage done to the surviving works, of which 700,000 were damaged by water or smoke. The estimated cost for replacing the 400,000 works lost was over $14 million. A second fire, on September 3 of the same year, destroyed the contents of the music department reading room. As part of the rehabilitation plan, LAPL sold its air rights to developers, enabling the construction of the eponymous Library Tower across the street. The skyscraper was subsequently renamed the First Interstate World Center and later the U.S. Bank Tower. Additional funds were raised through corporate and personal contributions which flowed from the effort of the "Save The Books" campaign formed by Mayor Tom Bradley. The campaign, co-chaired by Lodwrick Cook, then CEO of Atlantic Richfield Company (ARCO) had targeted a goal to raise $10 million through corporate and individual contributions ranging from schoolchildren's nickels and dimes to $50,000 contributions by Los Angeles businessman Marvin Davis and MCA Chairman Lew Wasserman. William Eugene "Gene" Scott, an LAPL neighbor and member of the 43 strong blue ribbon committee, donated the use of his University Network television studios and himself to what became a 48-hour telethon to raise $2 million towards the total objective. The Library's renovation was completed in 1993. It included a large new underground parking facility, with a park designed by Lawrence Halprin over it. The Central Library reopened on October 3, 1993. The Central Library houses and archives the extensive Los Angeles Public Library Photo Collection of over 3 million historic photographs from varied sources and collection acquisitions. Many images can be viewed by the public via the online photo collection. The physical Photo Collection is an important resource for researchers, writers, curators, and educators. The Photo Collection's sources have included: the former Los Angeles Herald-Examiner newspaper photo morgue (2.2 million images); the Security Pacific Bank Collection (250,000); the Los Angeles Chamber of Commerce image archives (60,000), Hollywood Citizen News/Valley Times Newspaper Collection (30,000), and the 'Turn of the century Los Angeles' collection (150,000). Collection sources also include the portfolios by noted local and regional photographers, such as: the Ralph Morris Archives (25,000) of the Los Angeles area from 1939 to the late 1970s; a collection of 1940s L.A. images taken and donated by Ansel Adams, and the William Reagh Collection (40,000—800 online) of post-war Los Angeles to 1991. The "Shades of L.A. Collection" is an archive of more than 10,000 images donated/duplicated from family photo albums (collected by former Photo Collection director Carolyn Kozo Cole) that expanded the archives to include the many diverse ethnic histories of people in the city, beyond the already well represented 'Anglo' population. The project's success expanded to the California State Library creating the "Shades of California" collection to represent the state's diverse communities, using the LAPL methods and model. The book "Shades of California: The Hidden Beauty of Ordinary Life" resulted from the successful statewide project. Over a dozen California city and county library districts also created local Shades of California collections, such as Monterey, Riverside, and Humboldt County. Located on Lower Level 2 of Central Library's Tom Bradley Wing, the Science, Technology & Patents Department's diverse collection covers agriculture, automobile repair, computers & computer science, cooking, construction (including building codes), consumer information, cosmetology, engineering, mathematics, medicine, nutrition, pets, psychiatry, UFOs, zoology, and more. In partnership with the United States Patent and Trademark Office, the Science, Technology & Patents Department is a United States Patent & Trademark Resource Center, offering resources to assist with patent and trademark research. The department holds a complete collection of all Patent and Trademark Office (PTO) publications including the complete Patent Gazette and Trademark Gazette issues from the opening of the PTO, and a complete set of registration books published by the United States Copyright Office starting from Volume 1. The patent collection also includes United Kingdom Old Law Patents 1617-1981 and United Kingdom New Law Applications 1979-1994. In 2012 Glen Creason, the map librarian for the central library, was invited to the Mount Washington home of John Feathers, who had died at age 56 with no known relatives. According to Creason, the cottage contained "at least a million maps" and the library was delighted to accept their donation. "This dwarfs our collection", he said, "and we've been collecting for 100 years." The maps were stored on shelves, in boxes, in file cabinets, and even in the cabinet of an old stereo system with its electronics removed. Creason said it could take a year to catalog and organize the maps and 600 feet (180 m) of shelving would be needed, but the library would then have the fifth-largest map collection in the country. 23 Van Nuys 6250 Sylmar Ave. 91401-2707 818-756-8453 East Valley Van Nuys Closed for renovations until Summer 2020. ^ Martin Gomez (February 2010). "City Librarian's Report to Friends Groups". Los Angeles Public Library. Archived from the original (.PPS) on June 20, 2010. Retrieved March 26, 2010. ^ "Los Angeles Library Foundation - Annual Report 2008-2009". Library Foundation of Los Angeles. 2009. Archived from the original on November 25, 2010. Retrieved March 26, 2010. ^ "Los Angeles Public Library Facts 2013 (for fiscal year 2012-13) | Los Angeles Public Library". www.lapl.org. Retrieved 2016-03-06. ^ Szabo, John (2015). "LAPL Strategic Plan 2015-2020" (PDF). Retrieved March 6, 2016. ^ "Board of Library Commissioners | Los Angeles Public Library". www.lapl.org. Retrieved 2016-03-06. ^ Toppo, Greg (2 June 2014). "Libraries' choice: Change or fade into oblivion". USA Today. Retrieved 28 March 2016. ^ Soter, Bernadette Dominique (1993). The light of learning: an illustrated history of the Los Angeles Public Library. Los Angeles: Library Foundation of Los Angeles. pp. 19–20. ^ "EARLY HISTORY, DESIGN AND CONSTRUCTION OF THE GOODHUE BUILDING | Los Angeles Public Library". www.lapl.org. Retrieved 2016-03-07. ^ Orlean, Susan (2018). The Library Book. New York: Simon & Schuster. p. 3. ISBN 978-1-4767-4018-8. ^ "TOM BRADLEY WING: HISTORY AND DESIGN | Los Angeles Public Library". www.lapl.org. Retrieved 2016-03-07. ^ "Los Angeles Public Library wins top award for cultural institutions". latimes.com. Retrieved 2016-03-07. ^ "National Medal for Museum and Library Service | Los Angeles Public Library". www.lapl.org. Retrieved 2015-10-26. ^ Fuentes, Ed. "Central Library Murals Are Also 80 Years Old". KCET. Archived from the original on May 21, 2013. Retrieved May 10, 2013. ^ "About the Central Library". Los Angeles Public Library. Los Angeles Public Library. Retrieved 25 May 2015. ^ Orlean, Susan (2018). The Library Book. New York: Simon & Schuster. p. 31,34. ISBN 978-1-4767-4018-8. ^ Orlean, Susan (2018). The Library Book. New York: Simon & Schuster. p. 34. ISBN 978-1-4767-4018-8. ^ Orlean, Susan (2018). The Library Book. New York: Simon & Schuster. p. 113. ISBN 978-1-4767-4018-8. ^ Myers, David W. (June 21, 1987). "L.A. Tower to Be Tallest on Coast : Ground Breaking Due Tuesday for 73-Story Downtown Building". Los Angeles Times. ^ "'Photograph Collection Overview' (online photos)". Los Angeles Public Library. 2011. Retrieved May 27, 2011. ^ Wikimedia Commons — Category: Los Angeles Public Library Photo Collection[permanent dead link] — Wikimedia category for images from the LAPL Photo Collection. ^ a b Bancroft Library — Shades of California Archived August 8, 2011, at the Wayback Machine . accessed March 30, 2012. ^ Community Arts Partnership—William Reagh Los Angeles Photography Center. ^ "Shades of California: The Hidden Beauty of Ordinary Life"[permanent dead link]; Edited by Kimi Kodani Hill; Heyday Books; ISBN 978-1-890771-44-7 ; accessed March 30, 2012. ^ Bancroft Library — Shades of California city and county collections links Archived August 8, 2011, at the Wayback Machine (bottom of webpage) . accessed March 30, 2012. ^ "The Science, Technology, & Patents Department | Los Angeles Public Library". www.lapl.org. Retrieved 2016-05-03. ^ Group, Public Information Services. "Los Angeles, California". www.uspto.gov. Retrieved 2016-05-03. ^ Pool, Bob (October 19, 2012). "Saved from Dumpster: Amazing map collection makes librarians tingle". Los Angeles Times. Retrieved 7 March 2016. 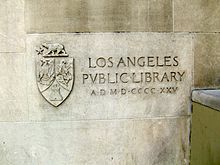 Wikimedia Commons has media related to Los Angeles Public Library. Los Angeles Public Library online Photo Collection: Photo Collection search engine.